Tantrayana is the third great vehicle of Buddhism after Hinayana and Mahayana. Tantra seems to have arrived in Sri Lanka soon after it appeared in India in about the 7th century. The earliest evidence of its presence in the island is to be found in the biography of the great Indian master Vajirabodhi who introduced Tantra into China. When Vajirabodhi was ailing just before his death in 733, he instructed his disciple Amoghavajira who was a Sri Lankan to return to India via Sri Lanka to collect Tantric texts unavailable in China. Amoghavajira arrived back in his homeland and was welcomed by the king who accommodated him in his palace for seven days. He met the famous Gabhadhatu Acariya and received both the Vajiradhatu and the Garbhadhatu initiations from him as well as several other empowerments. Later he collected 500 Tantric texts and detailed information on mudras, images, and the deities needed for making mandalas. He then left for India, returning to China in 746 when he presented the emperor with a letter and gifts from the Sri Lankan king. Tantra finally gained official recognition and patronage during the reign of Sena I who we are told had taken the Bodhisattva Vow. However as in Burma, China, Japan and elsewhere, accusations of sexual license persistently dogged Tantra and eventually it disappeared from Sri Lanka. Despite this archeological and literary evidence shows that it continued to have a presence until the 12th century and small groups of people continued to practice it, probably in secret, well into the 15th century. Several works composed by Sri Lankan Tantric masters are included in the Tibetan Tipitaka. Amongst these are a commentary on the Sadharmapundarika Sutra by Prithibandhu and Jayabanda’s Cakrasamvara Tantra. The most important of these works, Manjusrimitra’s Bodhicittabhavana, is one of the seminal texts on Dzong chen. This work lacks much characteristic Dzong chen terminology and thus may represent a branch of that school which evolved in Sri Lanka independently of India and Tibet. The Indian Tantric siddha Vanaratana (1384-1468) went to Sri Lanka in about 1404 and studied meditation for six years under Dharmakirti. As India was no longer a congenial place for a Buddhist by the time he left Sri Lanka he went to Nepal and from there made several trips to Tibet where he taught what he had learned from Dharmakirti. 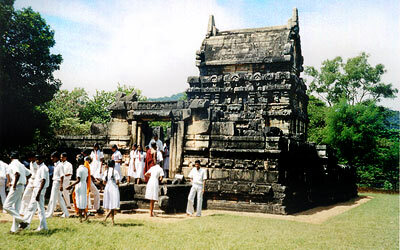 The Nalanda Gedage is the only major Tantric monument still existing in Sri Lanka and was built in about the 9th century. The Sinhalese word gedige is almost certainly derived from the Sanskrit ghatika meaning a college, in particular a religious college. It is tempting to think that Nalanda was a centre of learning and was named after the great centre of Mahayana and Tantric learning of the same name in India. Nalanda is on the main northbound road from Kandy and is 20 kms past Matale. A sign on the road clearly marks the turnoff to the shrine.